Each Tuesday we feature audio or video of an SR Contributor reading their work. Today we’re proud to feature a podcast by Svetlana Lavochkina. Svetlana Lavochkina is a writer of fiction and translator of poetry. Her novella Dam Duchess was chosen runner-up for the 2013 Paris Literary Prize. Born and educated in Ukraine, Svetlana currently resides in Germany with her husband and two sons. Her work has been published in Circumference, Witness, Cerise Press, Drunken Boat, Eclectica, Mad Hatters’ Review, The Literary Review, and Chamber Four Fiction Anthology. 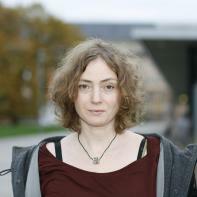 Svetlana is co-founder and president of Leipzig Writers, a non-profit organization supporting literary projects.